The north-west coast of Ireland from Donegal Bay to Rathlin Head. Scale: 1 : 191.200. One-minute gridlines. Larger scale plans of the Sound of Aran and Burtonport, Gweedore Harbour and approaches, Mullaghmore Bay, Lough Swilly, Teelin Harbour, Sheep Haven, Killybegs harbour, Mulroy harbour and Portrush. 2018 edition updated throughout and latest survey data applied. 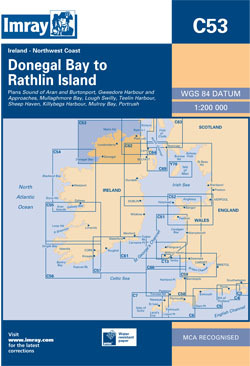 Depths updated in Mulroy Bay, New coastline and depths shown on Killybegs Harbour plan, Teelin Harbour and Killybegs Harbour plans adjusted to improve WGS 84 positional accuracy.